Recently married, Sunita and Srinivas were excited when they got to know about the new addition to the family. When Sunita was 7 months along, they began discussing baby names. Excited, these parents frequently visited the doctor, and were relieved to know that everything was normal. Unfortunately, the pregnancy took an abruptly tragic turn and Sunita delivered her baby weeks before the due date. On 2 December 2017, Sunita complained of stomach ache. Alarmed, Srinivas rushed her to the hospital. 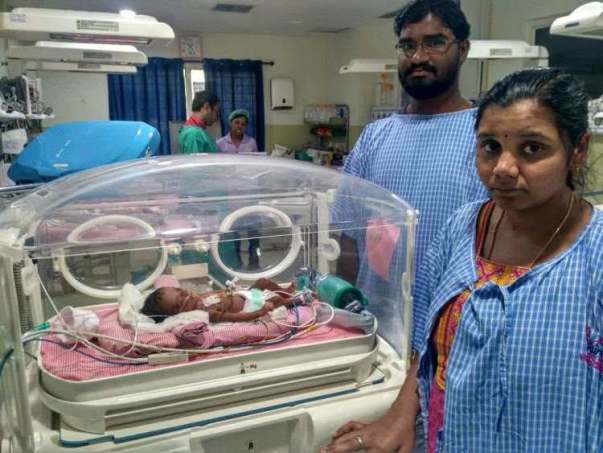 Upon reaching the hospital, the couple was told that a C-section had to be done immediately to save the life of the mother and the baby. 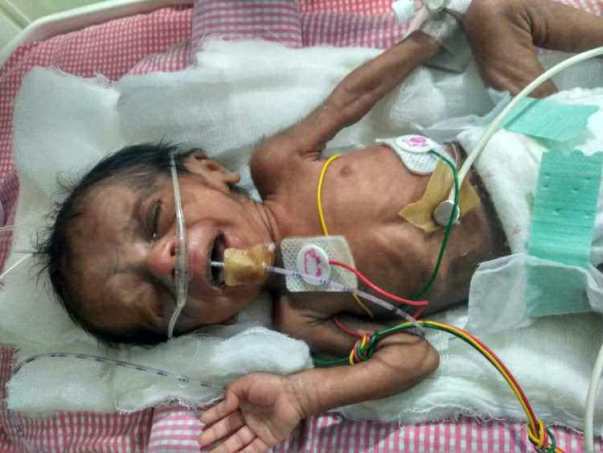 A baby girl was born extremely premature, weighing only 700 grams. She was taken to the NICU immediately and started on the ventilator. "Those few hours while I was waiting outside the operation theatre were the scariest I have been my entire life. I had never felt so helpless. My wife was inside, fighting a battle to save herself and the baby while I was sitting outside on a bench, hoping that I get to hear her speak again. When they finally told me that she is safe, I cried", recalls Srinivas. Ever since the ordeal, the family has had hardly any time to compose themselves. Post surgery, while out of any significant danger, Sunita too had to be kept in the hospital in critical condition. "One moment everything was fine, and the next I was begging God to take my life instead of Sunita's. She would beg me to let her out of the bed and see the baby herself. 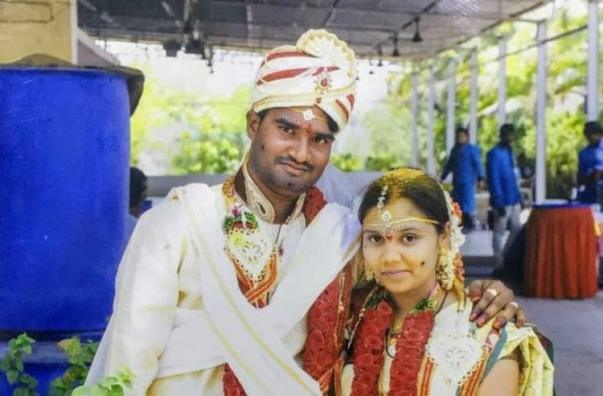 But she was too weak to walk, I had to make excuses to calm her down", says Srinivas. Srinivas, who works as a laborer is a sole earning member of the family. His income depends largely on the availability of jobs. 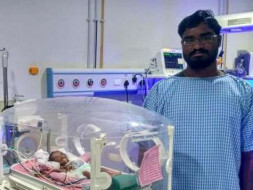 And now with the baby in the hospital, and Sunita at home, he is running back and forth to ensure both of their well-being. He is not able to take up any new work. Like any individual, they were hoping for a smooth delivery and the sudden shift of events has put a considerable dent in their pockets. 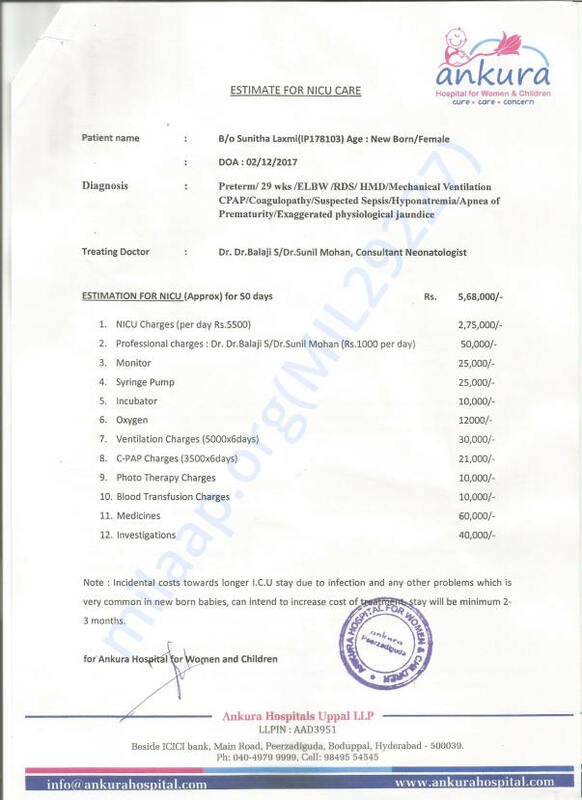 The estimated cost of baby's entire stay is Rs 5.68 lakhs and the family is finding it difficult to arrange for some. They have paid some of the amount but are still looking for ways to arrange for the major chunk. The couple is happy that their firstborn is showing considerable improvement, but at the same time are weighed down by the thought of ever-burgeoning hospital bills. "We have taken help of our relatives and somehow arranged Rs 2 lakhs. Now we have nothing left. We sold off whatever little jewelry we had and now I am even worried about raising up my daughter once she gets back home", says Srinivas. 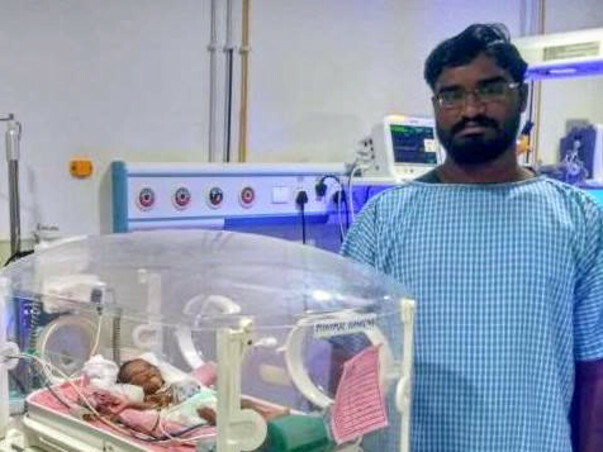 The baby will need to be in the NICU for another 20-30 days which will cost the family Rs 5.68 lakhs. They have already spent Rs 2 lakhs and exhausted all their other sources. Sunita and Srinivas are desperate to save their baby. 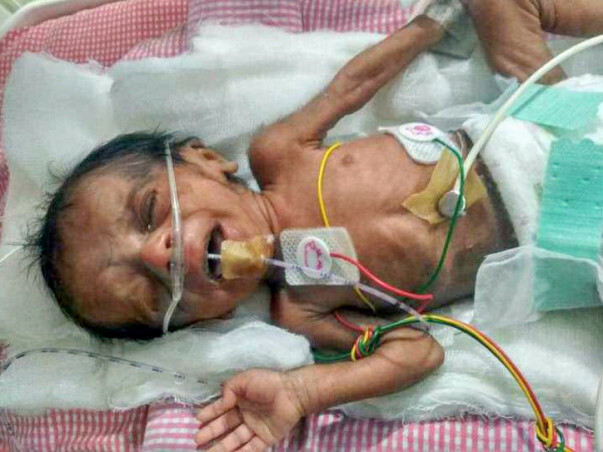 Only your contributions can save the baby's life. We are grateful for the generosity shown towards our baby! She is healthy and back at home now. She is doing well and does not have any issues with her health. Doctors have informed us that she would be lagging in her development by a couple of months as compared to children her age. This is apparently not a cause for concern and a norm for premature babies. Thank you each and everyone for supporting our family in difficult times! Thank you for the wonderful support that you have shown towards my baby. It means a lot to all of us, the support that you showed us in this difficult hour helped us in gifting a normal life to her. She is doing much better now compared to earlier and based on her health and recovery, the doctors suggested that we could take her home. We took her home on 2nd March. 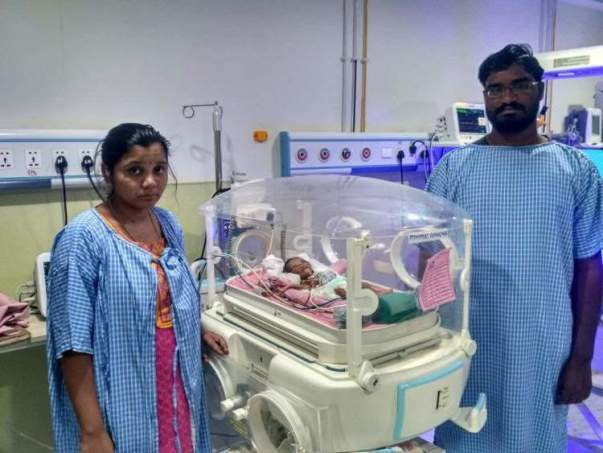 With your support and blessings, we have named her "Advitha". It means "unique". Thank you for the wonderful support that you have shown towards my daughter. I will never be able to thank you all enough. Thank you for all the love and support that you have shown towards my baby so far. She is doing better now and is on the road to recovery. She weighed 700 grams when she was born and now weighs 1.2 kilograms. The doctors have suggested that she will be needing NICU support until the weight increases to 1.5 kilograms. Based on her health the doctors will be able to suggest the future course of action. Thank you all once again for the support. Would request you to pray for her health and speedy recovery.